I am such a seasonal crafty person. I never realised until now, but I love craft activities over Autumn and Winter but I just don’t feel as creative in the warmer months. I think that we go out more in the warmer months and I just don’t feel as inspired. This time of year the darker nights and events (Halloween, bonfire night, Xmas) really inspire me. – black card or paper (not totally essential but makes more effective fireworks). – paint (we used a selection of colours, but whatever you have. The more watery paints work best. 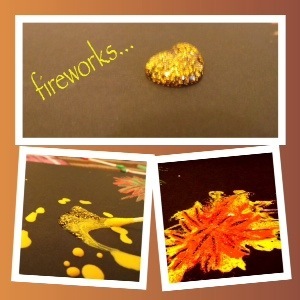 – Put a blob of a chosen colour where you want the centre of the firework. – Put a circle of another colour around it. 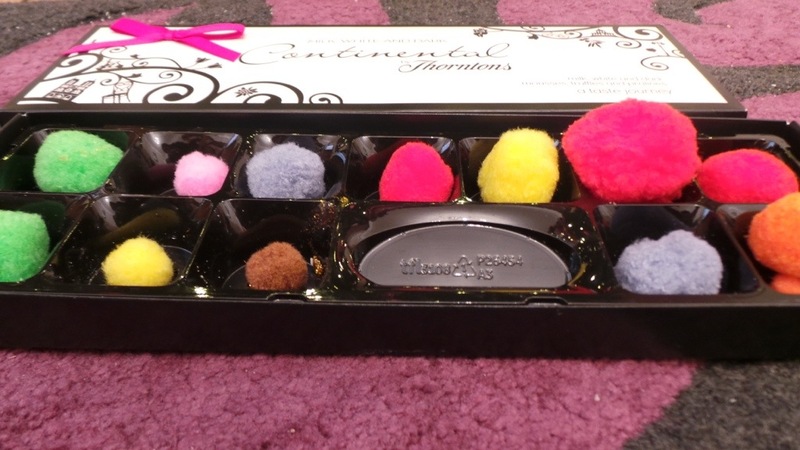 – Use a cotton bud, and start In the centre, moving outwards. Make lines outwards around the firework. 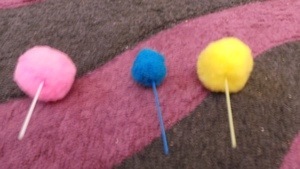 – I then added another colour on top and blended it in with the cotton bud. – sprinkle with glitter. Who doesn’t love glitter?! As you can see, it’s different to the one I made, but I was really impressed with the end result. 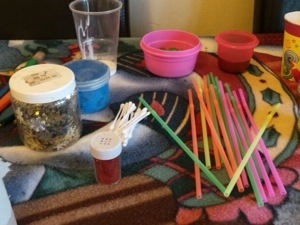 We have a good supply of paint / glitter and craft things, and it was nice to get them out to play. Mind you, I will warn you that the cleaning up afterwards is not nearly as fun! Using pastry dough (uncooked) as a messy / sensory play material (a bit like play dough). We made cakes and decorated them with sprinkles and spaghetti. 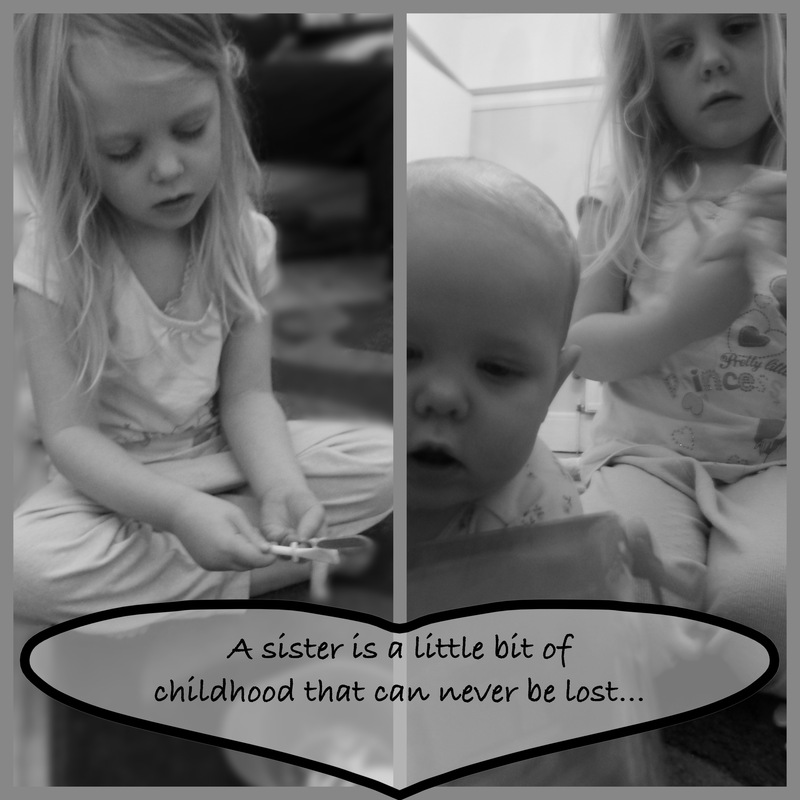 Sometimes I find that the best ideas for playing comes from children. I like to see what they seem interested in, and use whatever we have to hand to play. I am often surprised by how creative and resourceful children really are. Where I just saw pastry, they saw something they could really play with. Where I see things from a boring grown up world, children still see new and different possibilities. When I was making the pastry, Amelia’s cousin who was here to play seemed really interested in using it, so I gave her some. She rolled it out to make a pancake, and their play evolved from there. 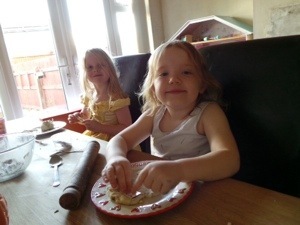 Because Grace was doing it, Amelia wanted to as well, so I quickly made up a small batch of short crust pastry, split it into two and gave them half each at the table. 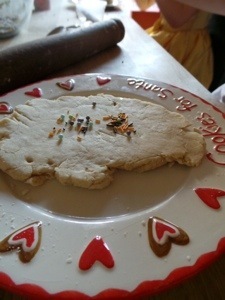 I then gave them a rolling pin, a few utensils, some hard spaghetti, some sprinkles in a bowl and some cake signs. 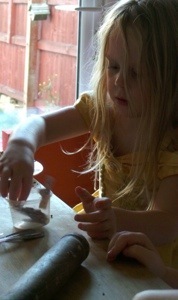 It’s a bit like play dough, and both girls enjoyed it and played with it for about an hour. They made cakes, and used the pumpkins as ovens for them, and decorated them. This is such a simple and easy thing to do. I was so impressed with pastry as a play material, and I know that it is a material that I will be using again and in different ways. It’s cheap, wasn’t too messy on the mess scale, and was really enjoyed by both girls. 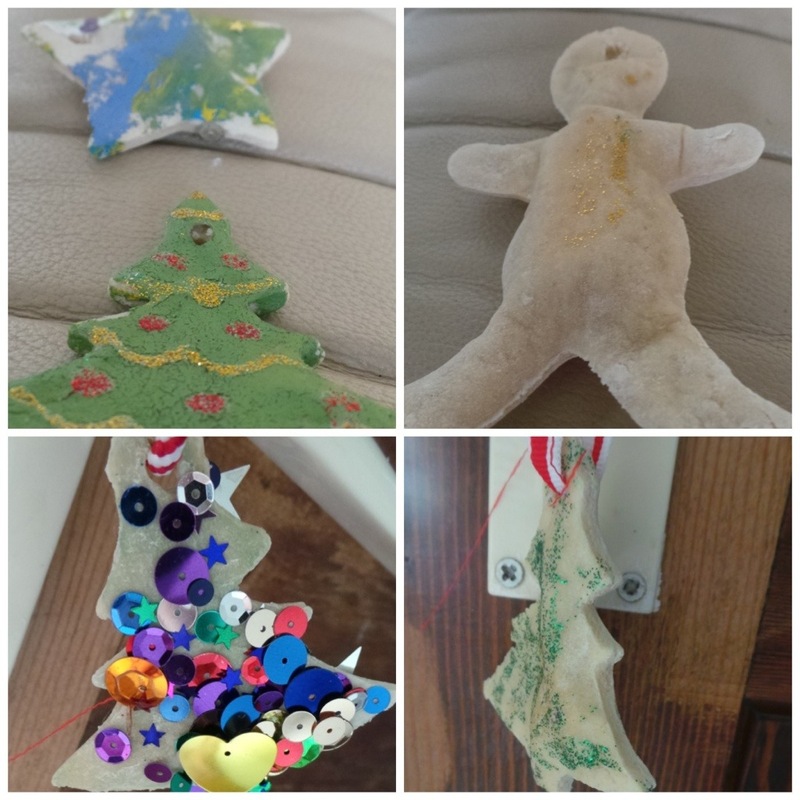 This week we’ve made home made Xmas tree decorations. It’s been loads of fun – so much better than buying them and I’m so excited to decorate our tree with our home made bits and bobs 🙂 Each year we add a few more home made things to the tree and its lovely to have all the memories, and I look forward to getting these things out each year to look at – I’m already excited about looking at last years bits from the attic, but these were just made out of card! So, to this year. I found a recipe for salt dough at red ted art and got excited by the idea of it. It’s easy to make and just used plain flour (one cup) salt (half a cup) and water just until binded together. Then it was baked for 2 hours at 100 degrees – really simple. Skewer a hole before baking though as its too hard to do afterwards, to thread ribbon or string through when done! 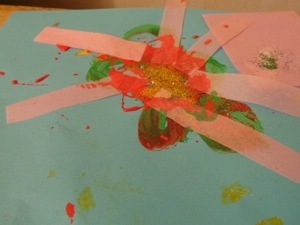 Then we got Paint and glitter glue out, and I just let Amelia do what she wanted. It was her idea to get the sequins out to decorate them too, and I think those ones look really good (even if they do keep falling off them!) I got just as much into making these as Amelia did, and I have some salt dough still in the fridge as I didn’t use it all so that I could see how the decorations turned out, and I’m thinking of making some bits on my own one night – is that a bit geeky?! 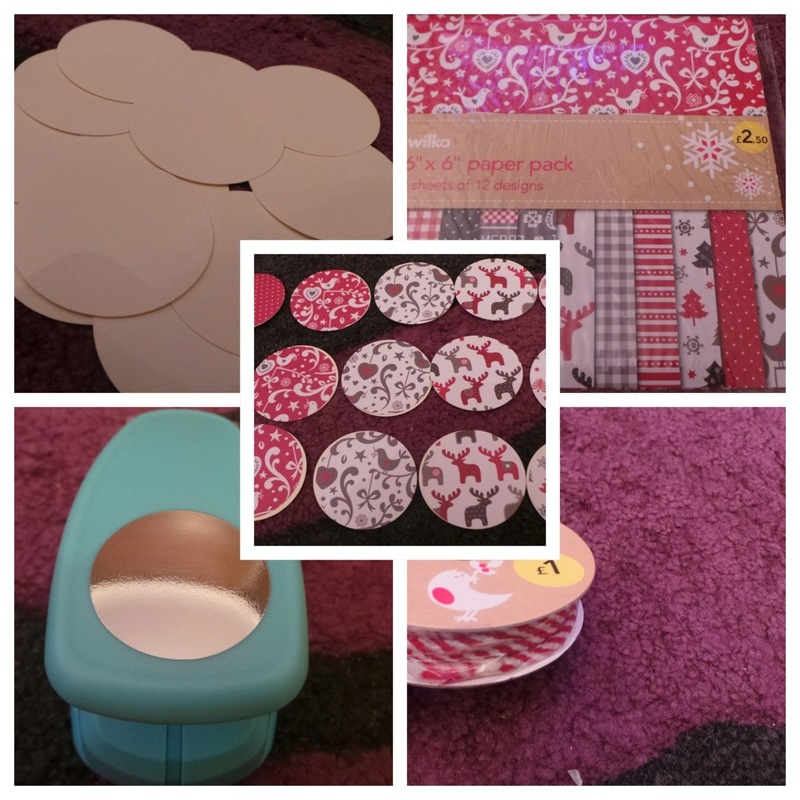 This activity has really inspired me and given me so many ideas – little Xmas gifts for family of the girls hand prints, some kind of garland decoration with some different shapes, could do all sorts! 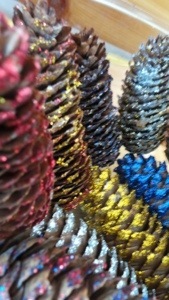 The other thing we’ve done is decorate some pine cones. A bit of glue and glitter and they look beautiful – better in real life that the photo below shows too. I’m really pleased with them, and they cost almost nothing. 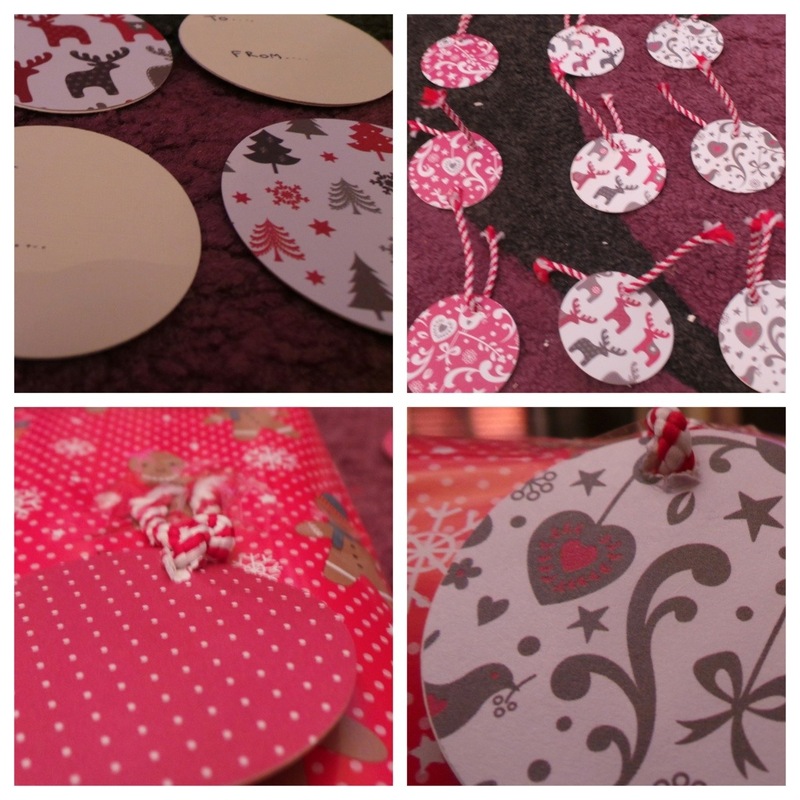 The one where I made gift tags.. I thought I was being organised – bought presents (not quite all, but I’m doing okay), bought wrapping paper ( a bargain – £3 for 2 12 meter rolls from wilkos) and I bought pretty ribbon. So what did. Forget? Gift tags. I did look at some, but somehow forgot to pick them up. I do hate spending money on stuff like that. So once my presents were wrapped I decided I’d make gift tags. And it was easy, took about an hour and I think adds a home made element to the gifts and shows the recipients that I love them as I took the time to make something I could have bought. 1. Step one – cut out a shape from a thick card. I make cards as a hobby so I had thick card and circle cutter. However, old Xmas cards, cardboard or a thinner card would work too. I used a circle shape cutter too, but you could cut them by hand. This would add a lot to the time but could be done. 2. Cut out the same number of circles from some pretty paper. Left over wrapping paper would be good – I bought some cheap paper from Wilkos for making cards in a few days. 3. Stick together. I used double sided tape, but I think glue would work too if that’s what you have. 4. Make a hole, and thread with ribbon or string. 5. Write on them and Sellotape to gifts. Done. I’m actually really pleased with these tags. The same method can also be used for Xmas tree decorations, but by decorating both sides of a shape. I’m going to try this when I do my Xmas tree decorations too.p, using different shapes. First things first, anyone who is likely to be receiving one of these cards (mum!) look away and don’t read this post! We used a few ideas that I’ve seen on other blogs – the baubles idea was from red ted art, and the reindeer hands idea I’ve seen too here and wanted to make as i thought it would make a lovely card. I have to admit that this card is my favourite out of all the ones we have made, and i may have to try to get Amelia to make another 1(or 2) of these. 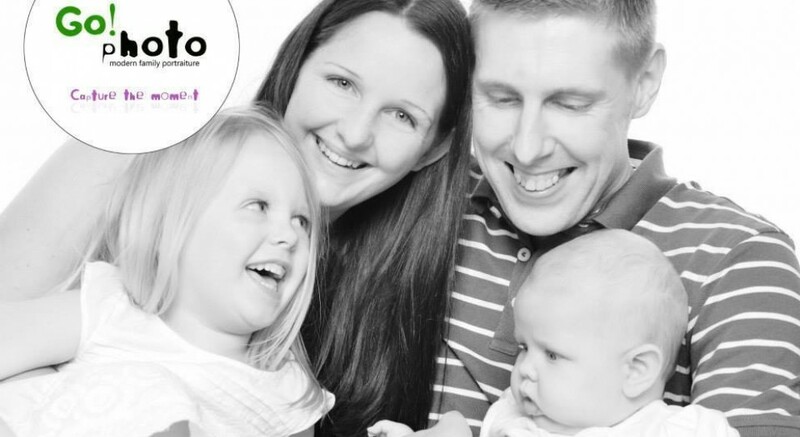 I’d like one for myself as a picture rather than a card, using all of our handprints too. See what I mean about having so many ideas?! 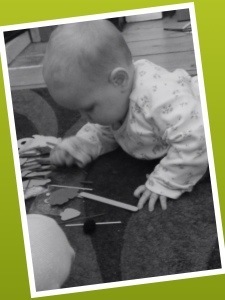 We had a lot of fun today making these cards – Amelia really enjoyed decorating with the glitter glue. I wanted to try a snowman too, but Amelia didn’t want to do that so we didn’t. But now I think we have enough cards to send out to our families from Amelia and Rosie, so mission accomplished. I’m making some of mine tomorrow night, along with my two sisters and a bit of mulled wine (well – if I get around to making it!) and maybe some kind of baking, so I’m sure the results will be blogged soon! For me, Christmas planning starts as soon as Amelia’s birthday ends. Her birthday is just over 5 weeks before Christmas and for me once the excitement of her birthday is over, it’s the perfect time to step up the planning. Her birthday was yesterday, so here’s the plan! 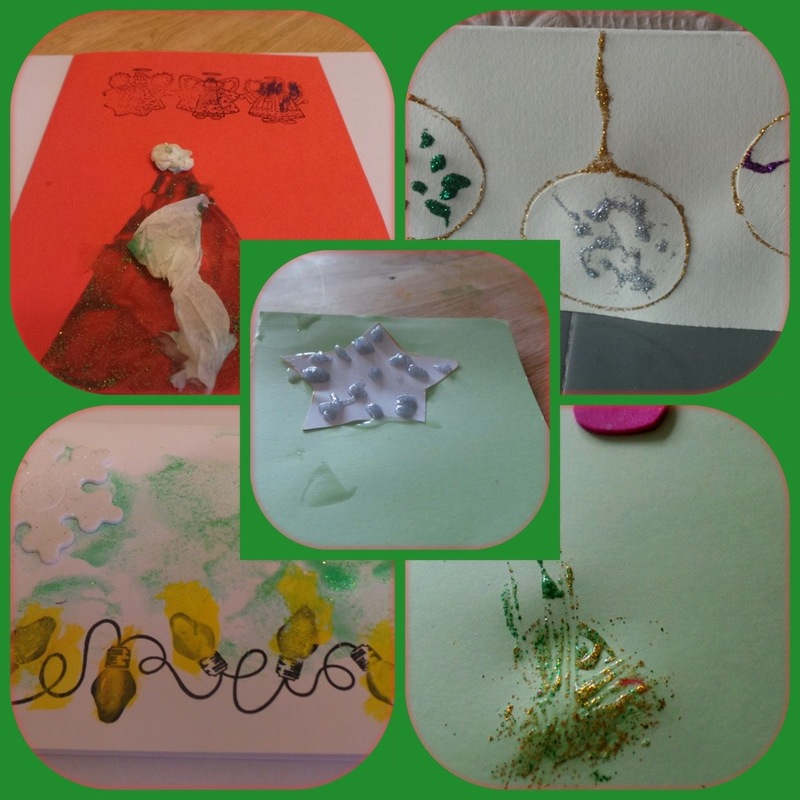 Friday 22nd November – make Christmas cards with Amelia. I’m going to get some materials ready and then just let her do what she wants. 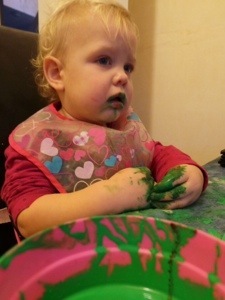 I also want to try to make something with Rosie’s hands if I can get her to keep still enough to make hand prints! 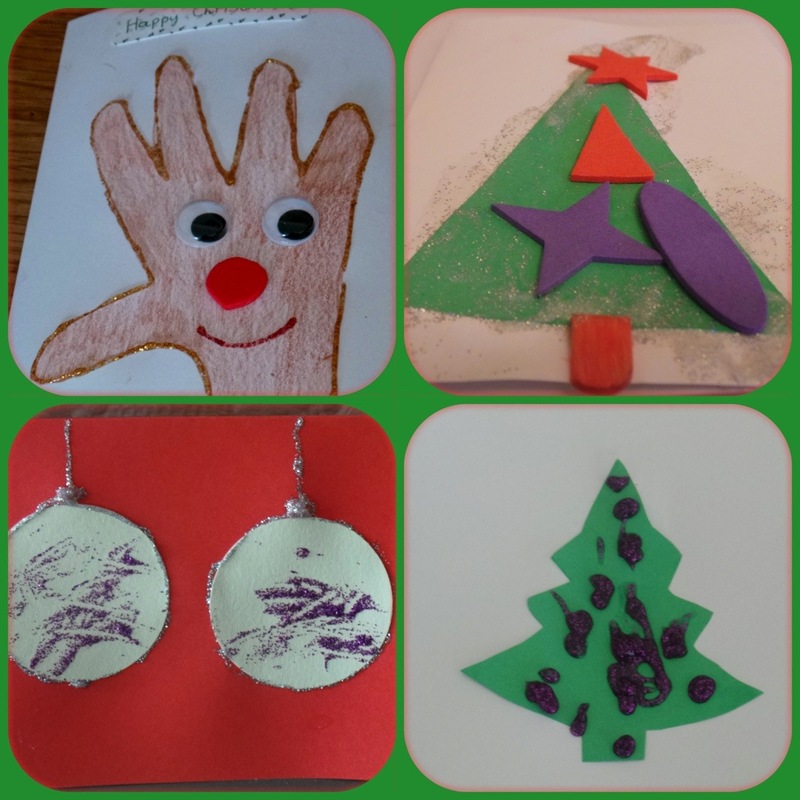 Friday 29th November – make Christmas tree decorations. We’ve made decorations before, but its good to build them up over time 🙂 I Will look for what materials we need, and find some ideas so that we are ready. Friday 13th December – make some home decorations, or finish gifts. Put up tree and house decs. Friday 20th December – baking day – mince pies, gingerbread men for tree. Maybe something with cinnamon. 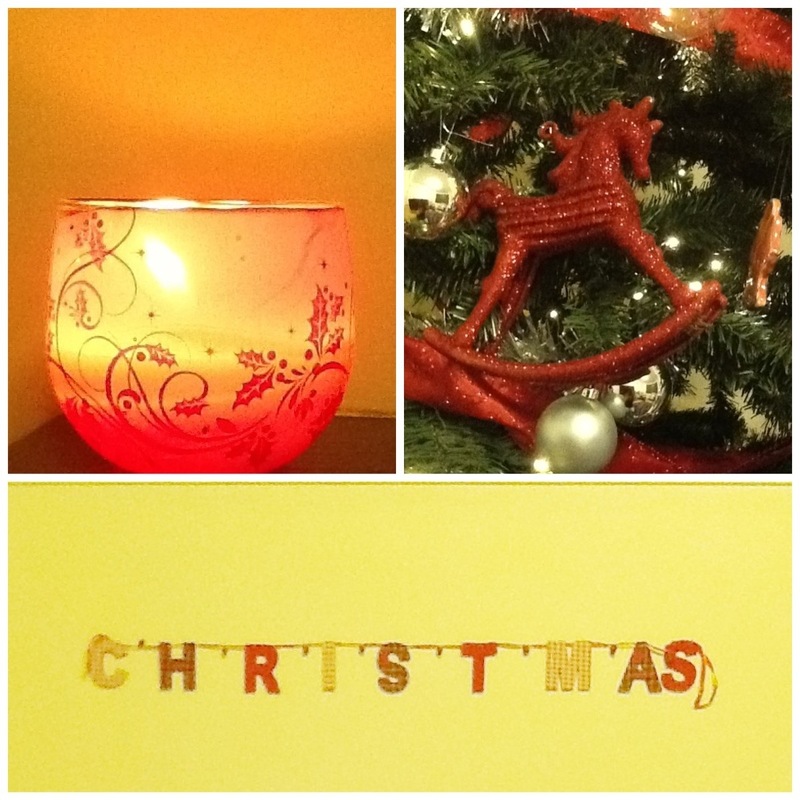 Week 6 – 23 and 24th December. I also have loads planned for myself – making my own cards, a couple of gifts, boxes, shopping etc too which i will blog in between I’m sure, but it gives me a headache thinking about it all so I’m keeping it simple for now! 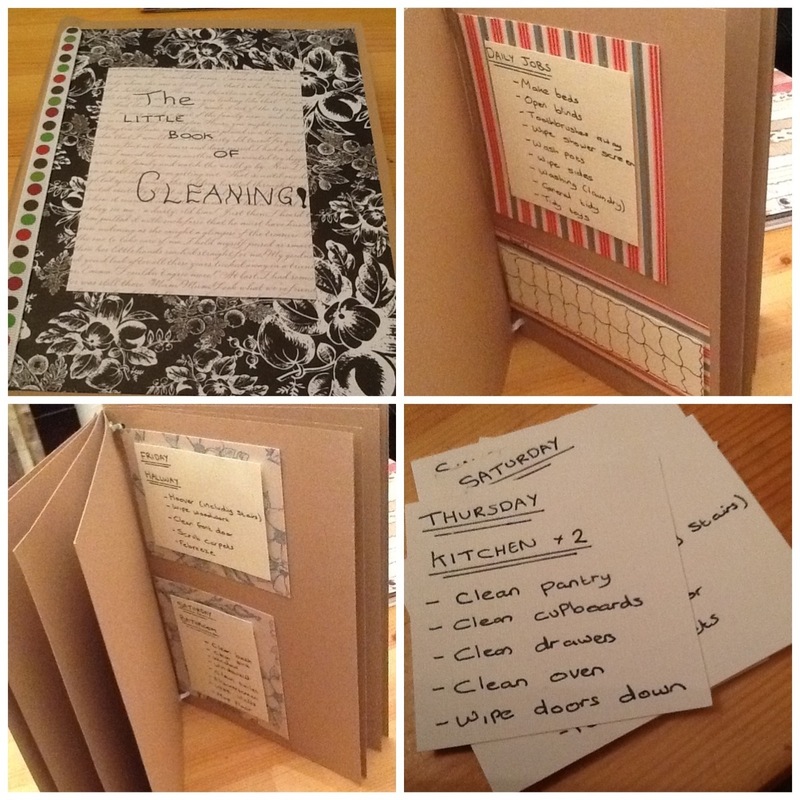 Today I decided to do a project I've had in my mind for a while – to make a cleaning schedule to focus on a room each day, on a two weekly cycle so that each room is done properly once every two week, and just general tidying done in between. I wasn't sure about how I wanted to make a schedule, so in the end I wrote out a list of jobs for each day in a two week period, a list of 'daily jobs' and an additional jobs section at the end. I have stuck each jobs section on with foam pads so that I can change them if I need to adapt it – particularly the additional jobs section as that will change each week. 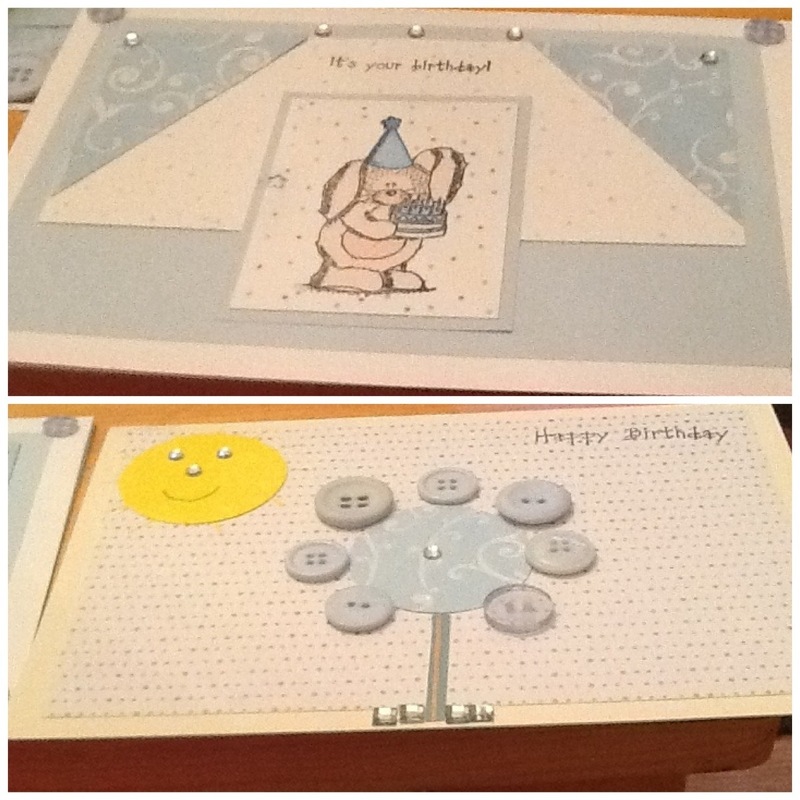 These are two cards that I made for my second cousins 1st birthday. I stuck with stuff I already had, used some leftover papers, and tried to make the colours I used appropriate for a 1 year old. Ones going to be from me, one from my sister. Which do you prefer? I can decide – I like the button flower as that’s something different for me that I haven’t done before, but I kind of think that the overall look of the rabbit card works better. In other news, my mums operation went well, she’s home now and her card made her cry ( in a good way!) she’s doing well so I feel really relieved.